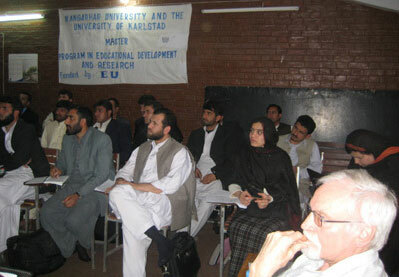 From 1 January 2008, Karlstad University coordinates an international educational project, the Masters Programme in Educational Research and Development (MAP) at Nangarhar University in Jalalabad, Afghanistan. It is an institutional cooperation project between the universities of Karlstad, Sweden; Tampere, Finland; Bochum, Germany; Kathmandu, Nepal; and Nangarhar University, Jalalabad, Afghanistan. The Swedish Committee for Afghanistan (SCA) is an associate partner in the project. The project is funded since 2007 by an Asia Link Programme grant from the European Commission, and as the project name implies, the goal is to provide a high-quality Masters Programme in Educational Research and Development at the Nangarhar University in Afghanistan. Till 2007, the project was coordinated by the Institute of International Education (IIE) at Stockholm University, where the groundwork for the project was carried out by Dr. Pia Karlsson (photo), Dr. Amir Mansory and Prof. Holger Daun from 2005. Pia Karlsson and Amir Mansory defended their PhDs from IIE in 2007, with a jointly written thesis, entitled ”An Afghan Dilemma: Education, Gender and Globalisation in an Islamic Context”. More information about the thesis and their research at IIE. SASNET was also involved in paving the way for the Nangarhar project by providing Karlsson and Mansory with a SASNET planning grant already in 2004 for a project entitled ”Opportunities and Obstacles for Girls’ Education in Rural Afghanistan a project including capacity development of Afghan Educators”. The purpose then was to explore possibilities of future cooperation between IIE and an education institution in Afghanistan, other than Kabul University. Mansory, Karlsson and Daun travelled to Afghanistan, and established contacts with the Faculty of Education at Nangarhar University (FoE/NU) in Jalalabad. As practically all higher institutions in Afghanistan, Nangarhar University was cut off from external inputs and support for nearly 30 years since the mid-1970s. Being a university outside the capital (it is located around 150 km south of Kabul) this situation still remains, since the major bulk of assistance today goes to Kabul institutions. After searching for different forms of funding to initiate a real collaboration project, this was finally materialised with the Asia Link programme grant in 2007, that also involved universities in Finland, Germany and Nepal. Soon after, it was however decided that IIE would withdraw its participation. Instead the project was moved to Karlstad University, and Dr. Pia Karlsson moved along to become project coordinator for the Masters Programme. Prof. Holger Daun at IIE is however also still involved in the project. MAP was formally inaugurated at the Faculty of Education at Nangarhar University in May 2008, in the presence of the Chancellor and other members of the University Management, local representatives of government bodies, media representatives, representatives from the partner universities and the project leaders and of course, the MAP students and other people from Nangarhar university. The programme is unique first of all because it is the first time that an educational training at this level has been implemented in Afghanistan. Secondly, it has a unique study plan, which includes not only theoretical courses but also practical research work in the field. It is also unique because it involves university cooperation between Asia and Europe. The teaching of courses, and managing the fieldwork, has been carried out by a group of teachers from the universities involved. Besides Pia Karlsson, Amir Mansory and Holger Daun from Sweden, the staff also consisted of Prof. Christel Adick, holding the Chair of Comparative Education at the University of Bochum; Prof. Mahesh Parajuli, Kathmandu University; and Prof. Tuomas Takala, Dept. of Education, University of Tampere. Full information about the Masters Programme in Educational Research and Development (MAP) at Nangarhar University. More information on the MAP programme website. In early 2011, the Master Programme in Educational Research and Development i Afghanistan (MAP) project was successfully completed with all targets reached. Read the final report sent to the European Commission. Pia Karlsson and Amir Mansory are now involved in a new Masters programme, focusing on teachers training. 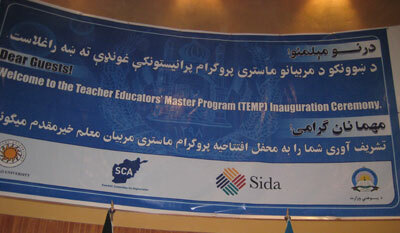 This Teacher Educators Master Programme, TEMP, runs as a collaboration project between Karlstad University, the Ministry of Education in Kabul, and the Swedish Committeee for Afghanistan (SCA). The programme is funded by the Swedish International Development Cooperation Agency, Sida. The focal problem is the low quality of teaching in Afghan schools with subsequent poor learning outcomes – a serious constraint for the future development of Afghanistan. Teachers are not qualified for their work. In order to contribute to improved learning outcomes, TEMP will specifically train a cadre of teacher educators, who will be able to design, implement and evaluate relevant and adequate teacher training programmes of high quality. TEMP plans for three intakes of 30 participants, totally 90 for the years of 2011, 2012 and 2013. The first courses are planned to start in December 2011. The participants will be registered at Karlstad University. The training will take place in Kabul at National Academy (NA) of Teacher Education Department (TED)/Ministry of Education. The TEMP programme was inaugurated in Kabul on 15 January 2012 in the presence of Sweden’s Ambassador Torbjörn Pettersson, prominent representatives of the Ministry of Higher Education and Ministry of Education, the Ministry of Women’s Affairs, Kabul University, Karlstad University and the Swedish Committee for Afghanistan. Six TV channels, the national radio as well as several newspapers reported from the event. During 2012 – 2014 up to 90 teacher educators, presently working at the country’s Teacher Training Colleges, will be trained in general and subject didactics, learning theories, education and development, and other topics. Before each intake of 30 students the participants will undertake courses in English, computer skills and study techniques for several months. 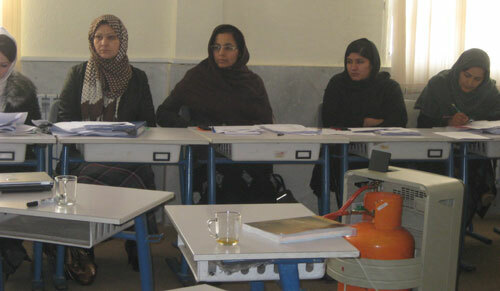 All teaching will take place in Kabul by lecturers for Karlstad University. At the inauguration ceremony, the representative of the students, Razia Stanikzai, one of the six female participants (17 are men), expressed her gratitude for implementing this programme on site in Kabul. “To come here we have had to move far beyond the current social norms. We highly appreciate all the support”. During April 15-30 2013 the first batch of students from the programme came from Afghanistan to Karlstad University to present their Master’s theses, visit local schools in Karlstad and meet with Swedish teacher students.